The Haxe Summit is Small Potatoes by Josefiene Pertosa. Haxe US Summit 2019 - Announcing the second Haxe Summit in the United States. The Haxe US Summit tickets are now vailable. Tickets are now $450. Andy Li - Building Giffon with Serverless and Haxe. Hugh Sanderson - XhX - 10 years of Haxe. Ryan Davis will talk about using Haxe for database engine building. Thomas .J Webb from Osaka Red LLC will talk about audio development with Haxe. You can submit your talk proposals for this years US Haxe Summit 2019 via the online form by Josefiene Pertosa. Photos from previous Haxe meetups via Josefiene Pertosa. Haxe 4.0.0-rc.2 has been released! Vshaxe 2.8.0 has been released! How do you initialize all elements of a Vector? Some questions about the Haxe C# implementation. Dicey Dungeons and Renaine games are at PAX East. A bunch of slides from the design postmortem of Dead Cells presented at GDC 2019. One big number from this presentation - Dead Cells has sold over 1 Million copies, about 60% of them on PC. Studio NX gave a talk at the Mail.ru Group office meetup about the conversion of Chronicles of Chaos from Flash to HTML5 using a fork of as3hx git. Checkout the full transctipt. Vadim Dyachenko wrote a blog post about what projects he’s been using Haxe for. Dead Cells had been nominated for 2019 British Academy Games Awards in the Original Property category! The Haxe 2018 survey results have finally been published, thanks to Valentin Lemière. 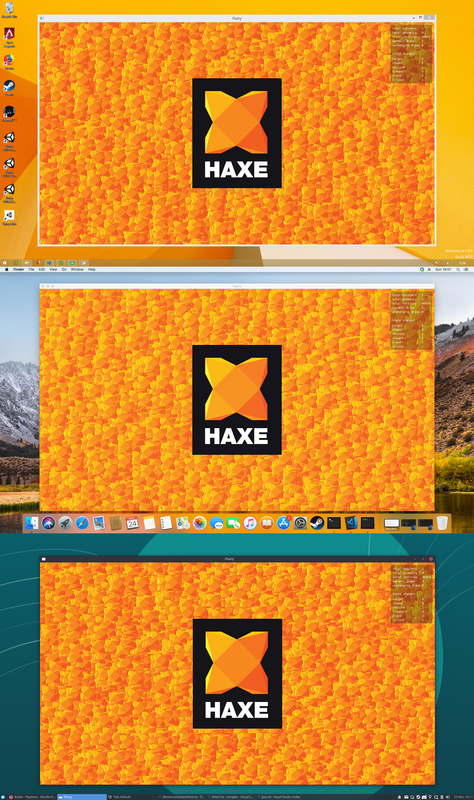 Haxe Survey 2019 - The results and follow-up discussion. Announcement trailer for Nintendo Switch version of Double Kick Heroes, a game made with OpenFL. Dicey Dungeons by Terry Cavanagh is nominated for Excellence in Design at Independent Games Festival 2019. Dead Cells is the Best Action Game of the year at The Game Awards. The Joy of Haxe - FontStruct’s love affair with a neglected programming language. A new article from Jaime Domínguez, How to profile Haxe HXCPP with Visual Studio. Dead Cells: Rise of the Giant DLC, Major update… Thing - An animated trailer. Art revamp for SUPER Cute Alien. Add a video related to Haxe. Double Kick Heroes will be at PAX East 2019 (28-31 March). Sebastien Benard, the Lead Game Designer of the Haxe-powered game Dead Cells, is announced as a speaker for the Reboot Development Blue game development conference at 11th-13th April 2019 in Dubrovnik, Croatia. The next Haxe Summit in Seattle is scheduled for 8th-10th May 2019. Come speak in the Haxe Track at Hong Kong Open Source Conference 14-15 June 2019 by Andy Li. Job offer in Durban, South Africa by Christopher Mandlbaur. The Proletariat Inc team is growing. They are looking for artists, engineers and strong community people. Apply Here! Sigma Software have updated their job post and now they are looking for a Senior Haxe Developer. Shiro Games are looking for a Game Designer and a Senior Game Programmer to join them. Lars Doucet’s latest bounty for $250 is if you can come up with a nice way to unify HXCPP and HashLink C bindings. The HaxeFoundation are still looking for a compiler developer to join the team. Lars Doucet’s list of various open bounties. OTO is a minimalist platform puzzle game by Lewis Lepton made during the notGDC Jam 2019. And he started development of a bigger version of OTO with more mechanics, more levels, sounds, music! fangoals.games is a game by MediaMonks made with Haxe and Pixi.js. You can playtest MONDAR’S DUNGEON - a game by Rat King and Jana Reinhardt. hidezip.com is a simple web app by Kevin Leung, made with Haxe and Coconut that lets you camouflage an archive file to make it looks like an image file in your file explorer. Huge free update for Northgard Relics is available now. Free new dungeon update coming to Super Dangerous Dungeons on 27th of March. The first free DLC for Dead Cells called “Rise of the Giant” will hit PC on March 28th. You can already check out the DLC’s Steam page. The Heart of Dead Cells is half artbook, half making-of. Jetstream game (made with OpenFL) by Clockwork Acorn is arriving on desktop on 2nd April. Something big is coming for OVERWHELM game. What it could be? Oh, it’s Nintendo Switch port which will come out on 4th of April with the new co-op mode, (which will be available only on the Nintendo Switch). Spellbreak is a new battle royale RPG with epic magic combat by Proletariat Inc..
keyValueIterator function example by Mark Knol. Matthijs Kamstra has created cc-webassembly GitHub repo showing how to work with WebAssembly from Haxe. Its working only with statics and welcomes any help to progress it further. HaxeVM is a prototype compiler/virtual machine in Haxe for Haxe. Aidan Lee continues working on flurry engine and has fixed the d3d11 backend, so it now works with 3 different graphics APIs on 3 different desktop OSs. [WIP] Haxe externs for the raylib library - raylib-haxe (currently not working). Austin East has added support for compound colliders into the echo physics engine. New screenshots from Peter Achberger - Merging, simplifying and converting polygons to convex ones for physics and pathfinding is easily done with hxGeomAlgo library. Fernando Bevilacqua has returned to development of Flixel Studio. Gradients look better than plain colours. Nanjizal has created two tests for the HxTrueType git library - Canvas version and WebGL version with source code available at GitHub. sketch.cc056 - another way of exporting canvas images. sketch.cc055a - Likes, Likes, Likes and the other side of an exciting life of a creative developer. sketch.art.CC053 - WIP experiment with circle text. Particle brushes in ArmorPaint allows to achieve rain effect. GraphG2 is a WIP node-based shader editor for Kha. Not exactly related to Haxe, but “Prisoner” from Dead Cells is now available in Brawlout. Multi snek by Sidar Talei. Gabrielle is working on her new game and managed to add a few things to the battle UI and added a small description for the selected action. Couple of WIP games/apps from Haxe Discord server, Cave of Adventure and yajg, a small jpg corruption tool. Shop for SHOTDOGS by Alex Johansson is fully refurbed. Playing a bit with constraints in Haxe and OpenFL. Ohsat Games is working on a new tileset for Attraction Force and also working on enemy death effect. Checkout Ohsat Games newsletter to get news, early access, pre-release builds and more. A quick little before and after of some new animations. Overhauled NPC sprites for PAX Demo. Levels now have unique fancy new pixelart intros. Some shopkeepers now have a special animation when you buy something. Duck duck from the game Ben Simms is making with Stencyl. 256 Texture Generator is a Haxe app made by Kaelan Evans with OpenFL for the Doom modding community. A character model made with ZBrush and ArmorPaint by Adler Romero. flgui git - Flash Like GUI for OpenFL. Checkout the most recent library releases on HaxeLib. [kha] Bitmap baking optimization (over 100x speedup) merged. Robert Konrad, the Kha author, is creating Programming Toolkits. Lubos & contributors are creating Armory, an open source 3D game engine in Blender. OpenFL is creating free open source software. HaxeUI is creating an open source user interface libraries. HaxeFlixel is creating an open source, cross plaform 2D game engine. Slava Ra is creating improvements for FlashDevelop and HaxeDevelop. Mark Knol is working on Haxe and its documentation. Dan Korostelev is working on the Haxe compiler. Lewis Lepton is creating tutorials, code and videos. Eric Bishton is creating the Haxe plugin for IntelliJ IDEA. Will Blanton is creating HaxeFlixel tutorials. Matthew Wallace is creating Haxe By Example tutorials. August Late is creating unique 2D lighting tech. Add support for default implementations within interfaces proposal. Add support for default type parameters proposal. 43~ commits have been made to Haxe compiler in the last week. PCRE Error 2 in macros issue. [display] No completion for key or value in key => value in map issue. Improve uninitialized var tracking issue. [matcher] null-checked pattern is not tempvared issue. [tora] Fix more errors & warnings on Haxe 4 merged. [python] Resources are not embedded issue. Haxe in Haxe notes, avoid OCaml and use JVM or HXCPP discussion for Haxe v5. @:using not working on interfaces issue & discussion. Static extension @:using doesn’t seem to work on abstract fixed. @:using should work on typedefs issue. Final vs. never vs. null pull request & discussion. [null safety] Null safety errors in inlined code issue. -D analyzer-* and @:analyzer details comment. [php] Improve generation of anonymous objects declaration with a 50% speed improvement issue.